Lens Description: The 85mm f/1.4 IF MC Aspherical Lens for Sony by Samyang is an ideal portrait lens. The f/1.4 aperture allows in a great deal of light and its focal length is perfect for capturing undistorted facial features. Each lens within its system has a multilayered, anti-reflective coating which reduces reflections of light on the lens surface and its internal focusing system provides smooth, grab-free manual focusing, which is also conducive to assured portrait photography. An iris diaphragm design helps to produce excellent bokeh, the slightly blurred, out-of-focus background that is a desired component of quality portraiture. 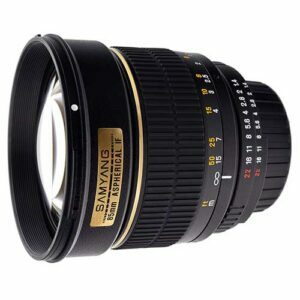 Another budget-friendly, quality lens by Samyang.